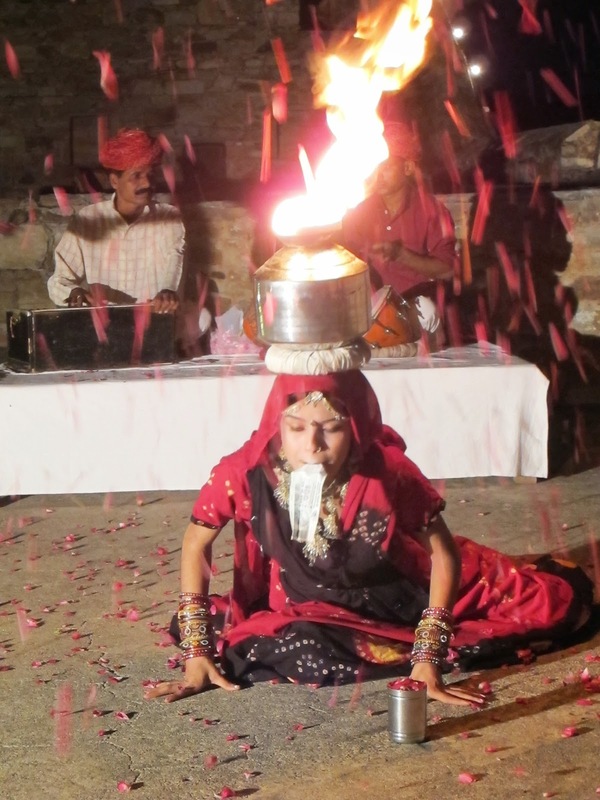 DEBBIES POSTCARDS FROM ....: ALWAR. DADHIKAR FORT. Alwar district is 150 klm ne of jaipur. 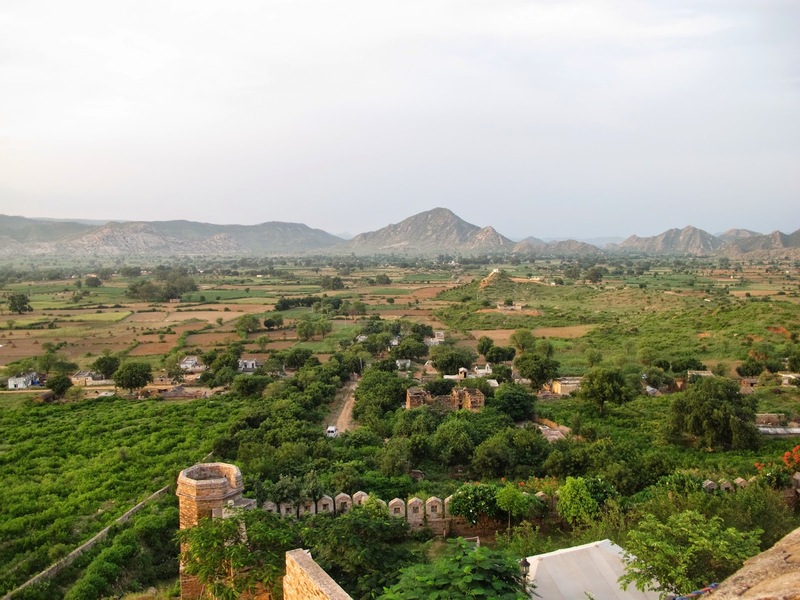 the former princely state of ALWAR is now a dusty, provincial town, visited by few tourists, except those on their way to SARISKA NATIONAL PARK. nevertheless, it has some remarkable monuments, built by the wealthy rulers in the 18th century, that are worth a visit. we stayed at this fort for 3 GLORIOUS NIGHTS. i had my own 'princess' balcony. i spent time out here, with my binoculars, as i could hear and see the male peacock & 2 pea hens. i stayed at the fort, for a few hours, while the others went into the town and went to the museum.they said it was worth the visit. i just needed time out. 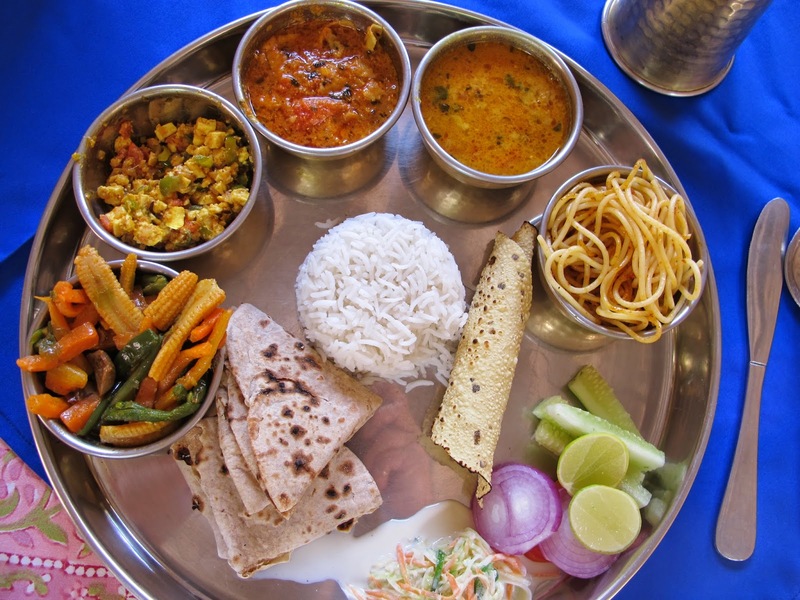 this thali,is not a typical indian fare. 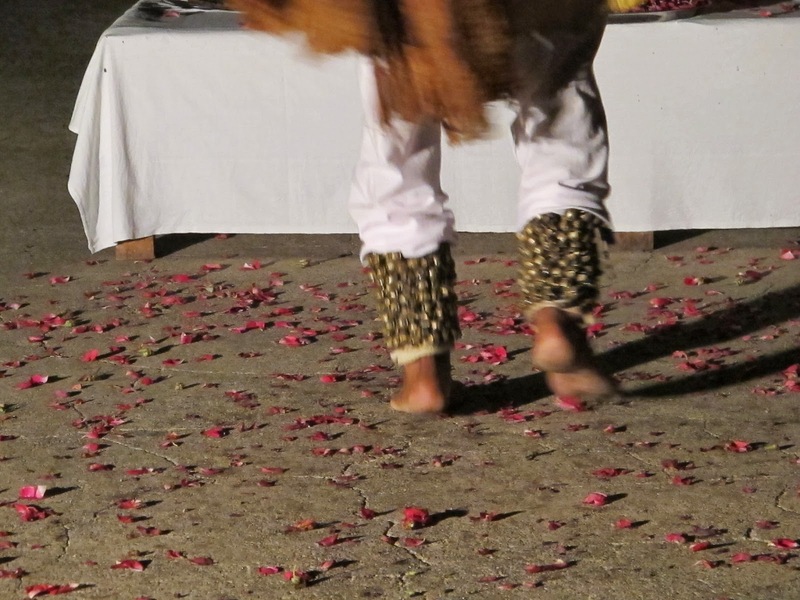 it was a combination of indian, continental influences. i especially enjoyed the crunch of the coleslaw. 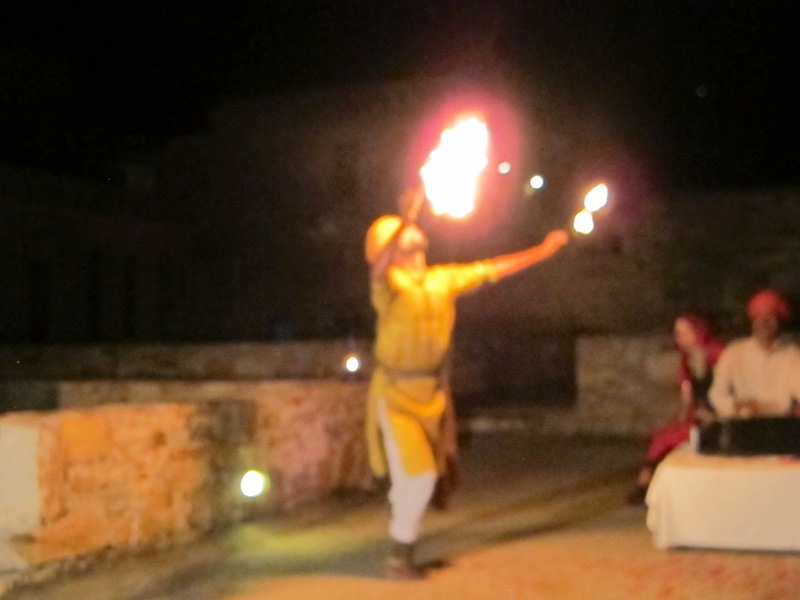 one of the nights we were there, we were treated to a delightful musical evening. these talented musicians from the local village, gave us a spectacular night. 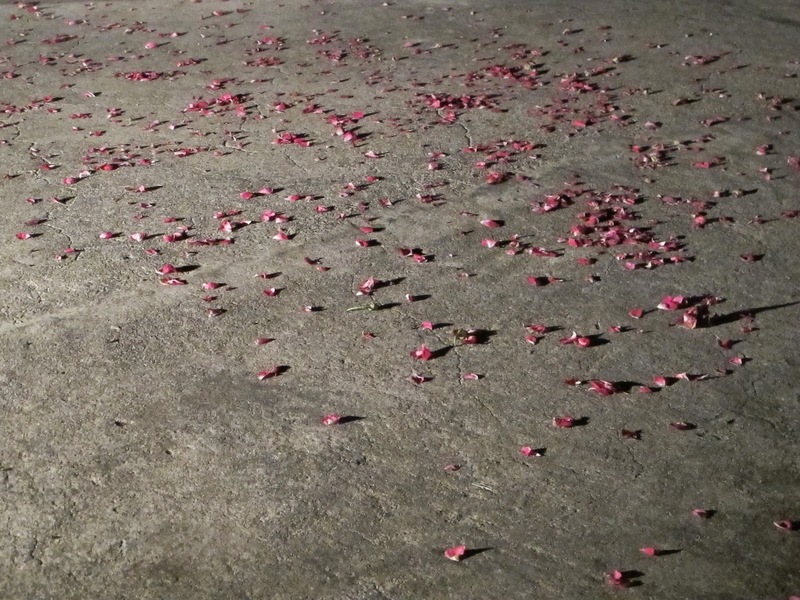 the rose petals on the floor, are the remnants of handfuls of sweetly scented red rose petals, being put on our heads. we all did smell sweet. they sat in our hair, in our clothes, on our laps. oh! the sounds of these bells. just another instrument really, when you think about it. NOT TO BE TRIED AT HOME. 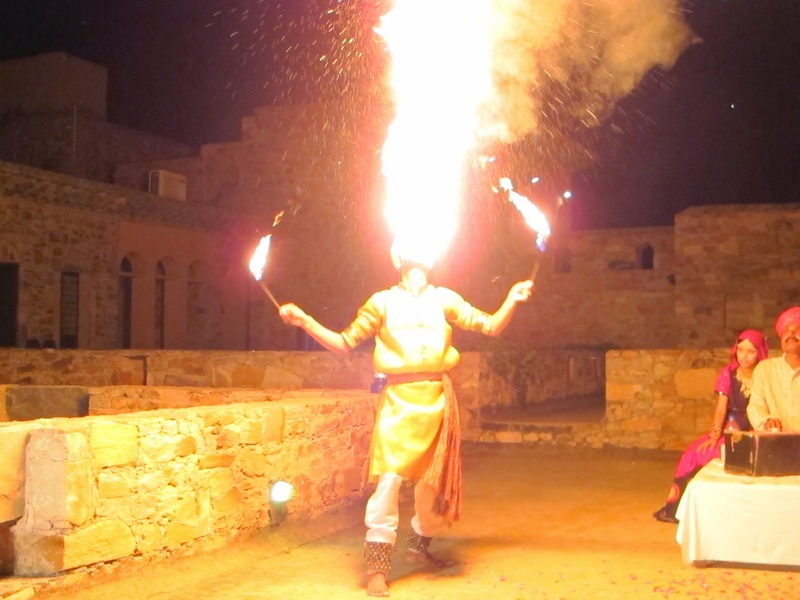 this man, put lighter fluid in his mouth and struck the match. we could smell the lighter fluid. his performance did light up the night sky. we had 3 glorious nights at this fort. i especially appreciated the opportunity to STOP. just rest, catch up on washing, sort photos out. write in journal. couldn't send a post card, as this fort did not have any. have restored it. still a work in progress in some parts. he designed it all himself. the courtyard garden, was truly a little oasis. there are mature trees and this all gives a wonderful sense of establishment.